Xiaomi Redmi Note 5 Flame Red color variant has been launched in China. The new red-colour model joins the already available Gold, Rose Gold, Black, and Magic Blue colour options. It comes with 4GB RAM and 64GB inbuilt storage and the specs of the phone remain the same as the original model. 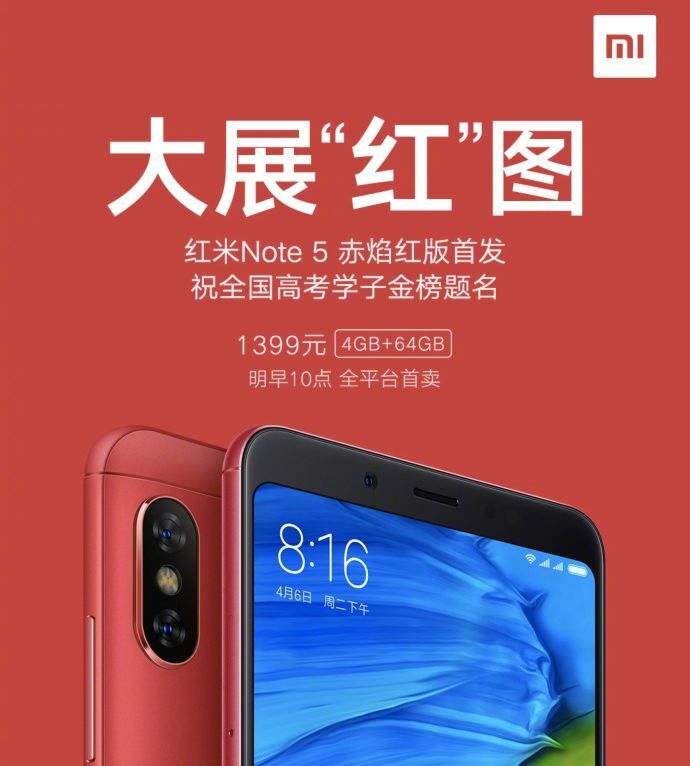 Xiaomi launched the Redmi Note 5 Flame Red colour model only in China as of now. It is to be noted that the Redmi Note 5 in China is known as Redmi Note 5 Pro in India which was launched in India in February. Both the smartphones are identical, however, there are some minor changes between them. The Xiaomi Redmi Note 5 Flame Red Edition price in China is CNY 1,399 (Rs. 14,500 approx) as mentioned in the Weibo post. The Redmi Note 5 (Redmi Note 5 Pro in India) 4GB model was launched for Rs 13,999 in India, but its price has been raised by Rs 1,000 recently and it is currently available for Rs 14,999. The new Redmi Note 5 Flame Red edition features a 5.99-inch FHD+ (1080×2160 pixels) 18:9 display. It is powered by a Snapdragon 636 SoC, coupled with 4GB of RAM and 64GB of storage that is expandable via microSD. The phone runs MIUI 9 based on Android Oreo. For imaging, it has a vertical dual rear camera setup with a 12MP primary sensor and a 5MP secondary sensor. Up front, it has a 13MP camera with AI and HDR features for selfies. For connectivity, it has 4G VoLTE, Wi-Fi 802.11ac, Bluetooth v5.0, GPS/ A-GPS, and USB Type-C. It packs a 4000mAh battery with Quick Charge 3.0 support.